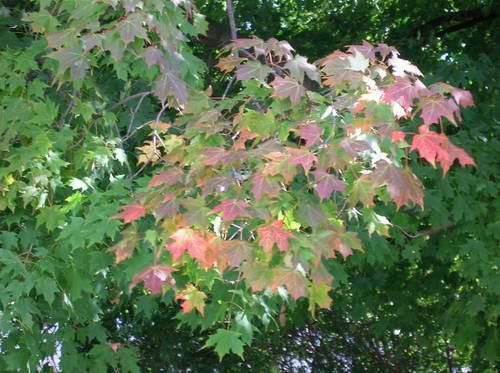 Fall is solidly approaching at this point - and I love it! I snapped this photo of our gigantic tree this afternoon - it's just beginning to turn gorgeous colors around the edges. Tonight we can hear football at the high school and geese on the lake, and I smell meat cooking somewhere! Also on the lake tonight I watched a Great Egret fly in and land on a tipped tree that leans out over the opposite side of the lake. I've learned that the Egrets on the lake are a sure sign of fall in these here parts. The Great Blue Herons are with us through the entire warm season, but the Egrets appear as it turns a bit chillier. The Egrets are also a bit smaller than the Herons, but when they fly in they catch my eye more easily because of their brilliant white. Both are breathtaking to watch. Peace to you this weekend and through the seasons ahead, All! Good evening on the eve of the Harvest Moon! The reminder fall brings of the cycles of nature - I'm not usually in love with Winter (sometimes), but when Fall comes I am reminded of the continuing cycles - and the fact that Spring is coming too! The anniversary of our beautiful wedding! The slow winding around of the Winter holidays. No, I don't mean I'm ready for Christmas, but I do enjoy the approach of the family gatherings and such. The return to the "school year" even though I've been out of school for years. In case you are interested but not yet familiar with it, there's a wonderful children's book about the moons that I'd be happy to share. Thirteen Moons On Turtle's Back is a collection of Native American stories telling the stories of the 13 moons of the year. The stories are collected from many different Native traditions, and the illustrations are incredible. The author Joseph Bruchac is a great collector and re-teller of Native American stories, and this is my favorite collection of his. I have the book if anyone would like to borrow! Happy Night and A Beautiful Harvest Moon (even in tonight's rain in Michigan/Ohio) to you All, Friends! May the season ahead bring you any change you need! 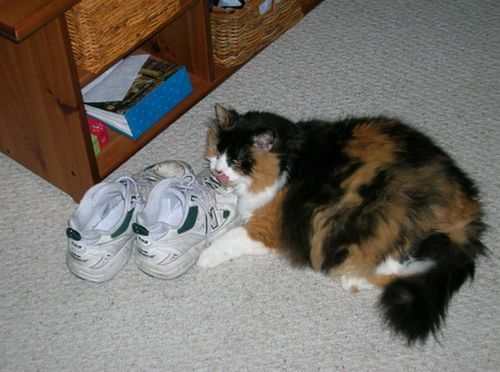 You might think "Gee, it looks like she's licking John's shoes," or maybe "Looks like she's getting a little shoe action?" Hello, good evening: and happy night to you, Friends! Because its a wee-bit "lateish," I recommend that we agree to celebrate it "every day?" In case you're a geek; like me, you can find information on this important celebration (and merchandise with punctuation humor!) here. Hello Friends - Happy Sunday! I find myself aimlessly surfing the internet with not much to share. I'm in the mood for blogging a bit, but alas - there's nothing there! Tonight is a working night at the club for me, and probably what I need most at the moment is a nap. Napping is also eluding me for the time being. The good news of the afternoon is that the Tigers are winning! John and I toyed with the idea of trying to fit in one more Tigers game (at the park) yet this week, but it's just not going to work. Instead, we settled on buying hotdogs to eat while we watch games this week! A wee bit of news for my few readers who know her - My freshman-year college roommate Tiffany had her third baby this past week! I've seen a short video - Bridget Sofia is perfect! Congrats to Tiffany and family on the addition! This week brings a lot of my now-almost-normal work routines, plus a few variations. I will take a ServSafe food class at Food Gatherers on Wednesday, and I will start interviewing for the open position I have to fill. Happy rest of the day to All. Be Well and Start Your Week Happy! They're in my picture at the top of the page, or at least they were around the time of this post! I got my new RED glasses in the mail today. The picture doesn't quite give you the full effect, but I like them! I'm glad it's Friday, and that's about all I have the energy for tonight. Happy Weekend to you, Friends - Be Well, Get Rested, and Do Something Fun! So, in the spirit of reporting pointless things: In the past year, my page has had 2,093 views with an average of 5.73 hits per day. I have posted 154 times. (Holy crap!) Did I mention that I love it? Thank you to everyone who has stayed with me and keeps reading - I hope you enjoy it at least half as much as I do! A small challenge for the coming year - make comments when you read something you want to speak to! Also, for the record - I am leaning towards creating a collage site now too, but haven't the faintest idea where to start! Separate but related: I can't believe that I started this little adventure last year on September 19th, and failed to recognize that it was International Talk Like A Pirate Day! Dante (my former boss at COSI) and I used to celebrate every year with only Pirate-speak in our office. He emailed me today to say that there was a headline on Yahoo this morning about the holiday! So, Mateys, with this 155th post - Happy Next Year of Blogging, and may you find great treasure on all your adventures! Arrrrrr! John and I are just back from a short overnight jaunt to Stratford, Ontario where we took in a show at the Stratford Festival. We saw To Kill a Mockingbird last night at the Avon Theatre, and stayed in a Bed-and-Breakfast hosted by a local family. The family's teenage son was especially welcoming and pleasant - what a nice guy! The show was amazing, of course. We had rented the old original movie (Gregory Peck) earlier last week to refresh our memories. It was a good way to go, to get the whole story back in our heads (since high school for both of us), and then to be able to see such an outstanding stage production. I had never seen a stage show of Mockingbird before, and it's pretty awesome. I didn't really expect to be intensely emotional at the show, having just watched the movie. Yeah, right - it got me, I cried and cried... there was a core group of cast members who sang several spirituals throughout the show, and the music is what really got me going! If you've never been to Stratford (and you enjoy going to a show or two), it's definitely worth the trip. Our border crossings were both simple and not too delayed (longer coming back into the States of course, but not as long as sometimes!). I was struck by one piece of the border crossing experience. Both customs officials (Canadian on the way there, American on the way back) were pleasant and friendly. The woman on the way into Canada gave us her set of questions which included "Where are you headed?" (To the Stratford Festival to see a show.) and "Are you carrying any firearms or weapons?" (No.) Then she followed up by saying with a grin "For some reason, nobody who's going to Stratford is carrying weapons. I could do a lot of psychological studies about all the people crossing here and where they're going..."
On the return trip, the man asked us the same afore-mentioned questions. When John answered that we had been at the Stratford Festival overnight to see a play, the American said "Isn't that just BORING?!?" Hmm... perhaps representative of the contrast between average American culture and a good portion of the rest of the world? Like I said - both were pleasant and our experiences were good. Slightly more contemplation from the Canadian side, though! Well, Good Sunday eve to you All - Be Well and Start Your Week Smoothly! I'm sitting here thinking about the things - just stuff, really - that I can't part with. Why is that? I have learned to part with a lot over the last many years. A lot of this learning process for me was related to cleaning out my aunt's house after she passed away. I got a very clear picture of the mental health challenges that come with having too much stuff, and I purged and purged. If you were sitting with me in the basement at this moment of course, you might question if I had ever gotten rid of anything. I won't say I've learned the whole lesson, and there are LOTS of things I need to and want to get rid of! So there you go. Make what you will of it. I don't think I'm mentally ill, but I have moments when I wonder if the stuff in the basement is an indicator. And in keeping with the theme (if we're on a theme) of "things I probably don't need," I just ordered new glasses! I'll let you know how they turn out. Be Well, Friends, and Be Taking Care of You. So I find myself writing a new verse to an ages-old folk tune. It's for a collage piece I'm just conceiving - a commissioned piece! Have you ever been so tired you couldn't sleep? That's about where I think I am at the moment. It's driving me crazy! (Crazier?) I have a long weekend of work behind me - a good weekend, with great shows at the club, but definitely a long weekend. Now I'm home for the afternoon and can't seem to nap. That's ok - tonight being the first Masterworks rehearsal of the year, I should go into it good and tired, right? (Ha!) Dinner at El Vaquero with Aaron ought to seal the too-sleepy-to-sing deal for me nicely. On the flip side to not being able to sleep, I'm getting some laundry done. John and I performed in church yesterday morning. All went well and we were nicely praised and amply thanked. UUs are good people! A minister friend of mine has just come into my family's church as an interim minister after the departure of the most recent minister, so it was good to see him there and feel that he will be a blessing for this church during a year (or so) of transition. The song John and I offered went fine, by the way - I was a bit nervous since it was new to both of us and not very familiar, but it turns out we're good anyway! I only see one vote on the new glasses frames so far... any others out there? Happy Monday to All - I hope your weeks are starting well. Be Taking Care of Each Other! The Tigers lost Tuesday when we went to see them live and in person! We had a great time, all the same - and got to see my friend Sean Casey pinch hit with two outs in the 9th. (He hadn't been in the game until that moment) He got on base and advanced a runner to 3rd, the crowd got crazy loud and excited, and the next batter was out - end of game! Oh well - we really did have a good time, and we're committed to going back for a few more games. I also got a Tigers cap - traditional logo and colors, but with pink trim! The Tigers have won all 3 games since Tuesday night, for the record. I have officially managed to miss every single art fair event I normally visit this summer. This weekend is the Black Swamp Arts festival in Bowling Green, OH - and with a full weekend of work, I'm not quite making it there! John and I did make it to the Old West End Festival fair early in June, but got stormed out of that one! Masterworks Chorale rehearsals start this Monday! (And Monday dinners with my brother!) I'll report more on our upcoming season as soon as I remember anything about it. John and I are performing in church tomorrow morning. This is a bit of an experimental piece for us - which we just started rehearsing today! We are off next weekend overnight to the Stratford Festival in Canada. We have tickets to see To Kill A Mockingbird (yes, we know it's not Shakespeare, but it's what we picked!). We're also staying at the "Wakey-Wakey Bed and Breakfast!" I am contemplating adding a new pair of eye glasses to my collection. If you're interested vote for a pair! (I'm leaning towards a red pair.) If you don't know, I discovered the craziest site about 2 years ago in 39DollarGlasses.com. I needed to wear glasses much more than my contacts at the time, but felt like I needed to have choices to make me interested in wearing them. I got both of my current pairs from the site, for $39 bucks a piece! The three frames you see here are in order from top to bottom: First a Burgandy frame identical to the black ones I have already (called "Milan! "), Second a purple- blue frame called "Urban," and Last a red/rose frame called "Roxy." I'm leaning towards one of them, but will see if anyone has thoughts to share. I know - it's hard to comment without actually seeing them on me, but go for it. Happy weekend to All, and please do something fun with it! Be Well, Good Friends! Happy Day, Friends! We're off to see the Tigers play at Comerica Park this evening! Follow up baking the cookies you said were a purposeful experiment with a batch of something tried-and-true - something you know can't go wrong! 6. Eat mounds of almost-cookies - the good news is that the whole thing fits nicely into your mouth in one bite!